Order a FREE catalog and sign up for the MLCS E-Club! 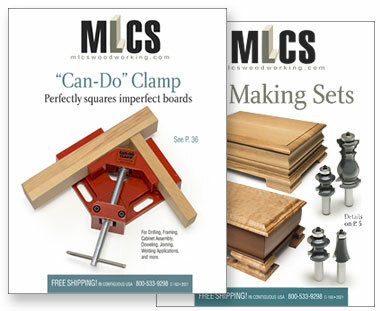 Browse the MLCS Print Catalog Digital Edition page by page and order quickly and directly without waiting for the paper catalog to arrive. Simply click the item number on the catalog page to add the item to your shopping cart. 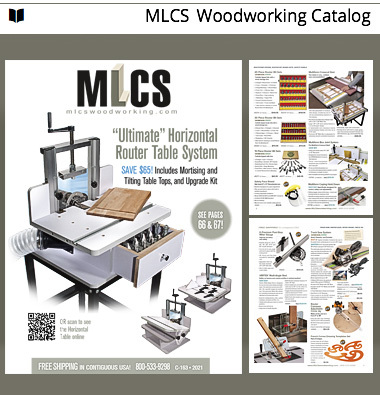 You can also view and print the latest MLCS Print Catalog in PDF format. Be aware the PDF file is 64 pages and quite large, and depending on your connection speed may take a few minutes to open. Of course, we'd still be happy to send you a paper MLCS Print Catalog by mail. Order the MLCS paper "printed catalog"
To receive our 64 page full-color catalog (with many "actual size" bit profiles) mailed to USA or Canada, please fill out the following information and press the SUBMIT button below. Please allow a week for delivery. International customers (outside USA and Canada), please click here. Multiple Addresses Found. Please enter an apartment or suite number or Re-enter. Please complete all required fields (Marked in RED with an *). Country (USA or Canada ONLY) USA Canada Outside US and Canada, view online above or order a catalog. Zip Code/Postal Code Please enter zip/postal code. Accepted formats: 12345, 12345-1234, K2P1Z4, K2P 1Z4. Current Address Status: Not Yet Validated. If you would like to request a catalog by phone, call toll free: 1-800-533-9298.